I have been reading the discussion cued by Jim Hamilton in his article, interacted with by Patrick Schreiner at his blog Ad Fontes, and further discussed by Matt Emerson in this article. Though I might be a 5’5″ near midget among giants here, I would love to enter the discussion with a few perspectives of my own. The discussion centers around how the Divine and human authorial intentions interact with the reader. When we read Scripture, must we read the text as though interpretations are strictly limited to the human author’s intentions? If I am speaking correctly, I believe Dr. Hamilton would assert that typology is the human author’s way of projecting their biblical theology so that their intentions may stretch beyond their immediate context and into the future of God’s salvation historical interaction with his people. This approach, which Hamilton labels the Biblical Theology approach, does not admit intepretations of Scripture that are incongruent with the human author’s original intentions. As opposed to TIS (Theological Interpretation of Scripture), mere divine intention is not warrant enough for a Scriptural interpretation, because it separates the text from the mooring of human intention, setting the ship afloat upon a sea of arbitrary interpretation. Schreiner raises several questions about Hamilton’s proposition, pointing to clear texts, particularly in the Gospels, where even the greatest hermeneutical gymnast would have to admit the NT writer has clearly violated or at least gone far beyond the original author’s intentions. He argues that perhaps a category in interpretative theory that allows for consideration of interpretation that might not have been originally intended by the author could be appropriate. I especially appreciated Schreiner’s comments about texts that have been edited. If, for instance, one believes that Ezra edited the final edition of the OT or that Moses’ works were edited after his death, each of these texts now in effect has multiple human authors and a divine author. This adds a whole other fold to the cloth. I would add to this point (as I’m sure Patrick would) that we must also consider that God has authored not just the Scriptural account of history, but history itself–this too adds yet another wrinkle. In Matt Emerson’s article, he points out the cogent point that to a certain degree pitting authorial intent against Divine intent is a misconception, because both are meant to work in concert–each text is both 100% the product of man’s pen, and 100% the product of the Holy Spirit’s breath. 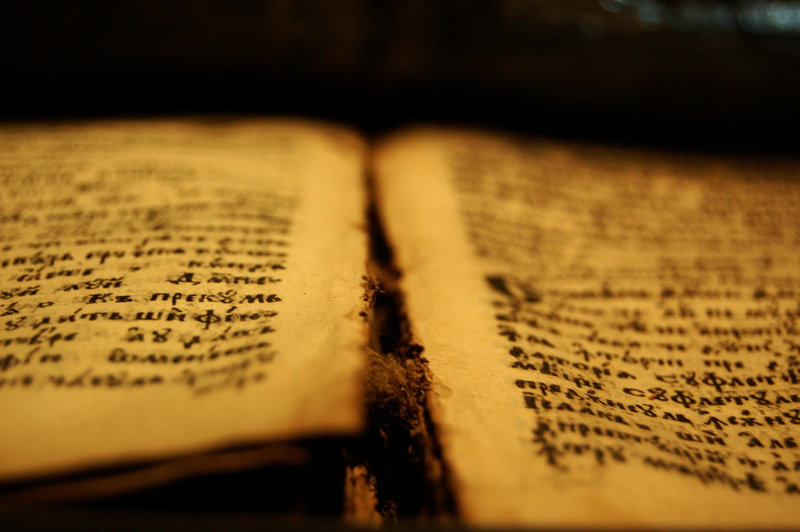 What is the Function of Scripture? We are a people who communicate to our God through a text. Some religions use icons, some idols, some non-physical mediatorial elements; we have a book. And in that book, the preeminent and elevated person we meet is Jesus Christ, the Word made flesh. Our relationship to the Father is mediated by this Jesus Christ, our Great High Priest, who meets us in the text of Scripture. Now, our interaction through Jesus with the Father is facilitated by the Holy Spirit which Jesus sent into believers that he might guide us as God’s people to see Jesus in Scripture. We are a people of the book. We pray the book. We read the book. We study the book. We memorize the book. But why? Because in that book we find our Savior Jesus Christ. All of Scripture, whether of the Old or New Testament, acts as a giant Las Vegas style neon arrow pointing us to Jesus Christ, the only Mediator through which we are able to commune with our Father. The Scripture, are a table of sorts, a place where we meet God–because in that Scripture is found Jesus Christ, the Word of God. In Genesis, we find the words of one of the best human authors to have walked the planet. Moses’ work in creating motifs, repeating themes, and establishing types is incredible. He was defining the relationship between a God and His people by giving the people a religious vocabulary through which to talk to a God which these slaves–freshly emerged from Egypt–hardly knew. Relationships require language; we cannot communicate without it. We must realize that as much as Moses was communicating historical truth to the Israelites, he was creating types, motifs, and biblical imagery through which God’s people would continue to define their relationship to God forever. Salvation history is the story of how that people continued to understand their relationship to their God through the lens of the past. The creation, the Passover, the exodus, the parting of the Red Sea, the giving of the Law, the sacrifices, the conquest of the land, the kings–each generation of God’s people has realized how they fit into the historic relationship God has established with his chosen ones. As we come to the New Testament, the Gospel writers help us to realize that salvation history finds its culmination in Jesus Christ, the Exalted Messiah. The Scripture and all of its biblical language is put to work to describe our relationship to God through the New Covenant established through Jesus’ blood. Types, imagery, historical events, and motifs used over and over in the Old Testament now find their ultimate purpose as they describe the way Jesus has rescued his people from Sin and Death. How Then Do We Interpret? Fulfillment, as explained by the Gospel writers, then becomes the keyword when relating Jesus to the Old Testament. It is not a violation of the Old Testament author’s intention to take his text and use it to explain who Jesus is and what he has done. Rather, the OT author stands by applauding, with the same kind of pride that an artist feels when he sees his work put into a new context or given new appreciation. Why? Because that is precisely what he has done to the authors of Scripture that came before him. In the Gospels, we see a renewal of the biblical vocabulary in which each type now finds its truest sense in Jesus Christ. How then should we view the interaction of human and divine intention? I believe we must first realize that the highest aim of both human and divine author alike is this: to exalt Christ. Our mooring for interpretation is Jesus Christ. I do not mean this in some mystical outside of Scripture kind of way. Jesus Christ is quite literally the Word of God, and by labeling him as such, the Apostle John communicates this interpretive principle. However, I believe once we agree that the writers of Scripture–however limited their knowledge of the Messiah might be–and the Holy Spirit both were seeking to display the glory of the Father in Jesus Christ, we can realize that interpretation is not so much about conforming to the human author’s intention, as it is about seeing how the human author’s text contributes biblical language to describe our relationship to the Father through Jesus Christ. As readers of the text, we care what the human author has to say, and we care why he says it because it inspires worship of the Father through the historical and religious truth it proclaims about the Messiah. When a Gospel writer uses the language of a prophet or the psalmist to communicate truth about Jesus, he is performing the highest duty any believer can do for that prophet or psalmist: taking that passage captive and making it obedient to Christ. When we read a text in Scripture, we ought to speak about that text in the biblical language handed down to us in the Scriptures: types, imagery, historical events, and metaphors. Interpretation then becomes an exercise in talking about the Bible using the Bible’s language so that we can know our God more through our Savior Jesus Christ. Each author of Scripture has set an example for us in this exercise, and the text has been handed down to us for this purpose: that we might find unity with all believers in our relationship with God through the mediating Word of God, Jesus Christ. I would invite discussion, interaction, and correction, all in brotherly love. All comments welcome! Thanks so much for your thoughts! Your exhortation toward reverence is so key when we approach the Scriptures. How often do we find ourselves standing in judgment over the Scriptures, critiquing the Gospel writers’ “deficient hermeneutics”, when in fact we ourselves are the dolts who don’t know our Bibles well enough to follow their deep exegesis! I wonder whether we need to revisit our theology of the Holy Spirit. We affirm his role in superintending and guiding the writers of Scripture, but we fail to remember that he has made it his duty to exalt Christ in all things–including the very Word that he breathed out. As those in whom God’s Spirit dwells, we must come to God’s Word with humble submission, as those ready to learn, ready to meet their God, and ready to obey the commands of Christ with a simple, childlike obedience.